To report the surgical outcomes of children with cataract associated with microphthalmia, microcornea, or persistent fetal vasculature (MMP) and children with isolated cataract. The study included 111 children (cataract associated with MMP: n = 25) who underwent cataract surgery at younger than 16 years. Exclusion criteria were duration of follow-up less than 5 years, intraindividual differences in age at surgery, eye disorders other than MMP, secondary cataract, and syndromal diseases. Main outcome measures were proportion of eyes with glaucoma and best corrected visual acuity (BCVA). Both groups were dichotomized by age at surgery (early intervention group: ≤ 48 days). Descriptive analysis was performed throughout. Median age at surgery was 3.9 months for cataract associated with MMP and 23.3 months for isolated cataract. The median (interquartile range [IQR]) duration of follow-up was 95.9 months (range: 76.0 to 154.5 months). In children with bilateral cataract associated with MMP, the proportion of eyes with final BCVA worse than 0.3 logMAR was similar regardless of age at surgery (early intervention: 80%, later intervention: 78%). In bilateral isolated cataract, the proportions were 56% and 33%, respectively. Children with cataract associated with MMP had a high prevalence of glaucoma (28%). Glaucoma prevalence was lower in the later intervention group. In the presence of MMP, early cataract surgery is associated with a high risk of post-lensectomy glaucoma, but does not offer the benefit of better visual outcomes. Data on the long-term visual outcomes of children with congenital/infantile cataract associated with MMP are sparse. Previous studies reported satisfying functional outcomes, with the risk of glaucoma ranging from 14% to 31%. However, it is unclear whether the potential for visual improvement is similar in eyes with cataract associated with MMP and eyes with isolated cataract and whether the recommendations regarding age at surgery apply equally to both groups. In children with congenital/infantile cataract, there is most likely a refractional and a deprivational component of amblyopia affecting normal visual development. Short axial length and refractive errors due to microcornea may be additional stimuli contributing to refractive amblyopia. Persistent fetal vasculature most likely adds deprivational stimuli. Furthermore, MMP, especially in association with cataract, may be a sign of more generalized systemic conditions.24 Thus, the overall outcome of eyes with cataract associated with MMP might be determined not only by the higher risk of aphakic/pseudophakic glaucoma, but also by a pre-operative visual disturbance that is inherently more severe than in eyes with isolated cataract. In this study, we describe the outcome after surgery for congenital/infantile cataract associated with and without MMP, respectively. To investigate whether the standards of practice also apply to congenital/infantile cataract associated with MMP, we compared the potential for visual improvement in both groups and put it into context with the risk of aphakic/pseudophakic glaucoma. This retrospective cross-sectional study had local trust approval as service evaluation (CA15/ONSP/14). The study adhered to the tenets of the Declaration of Helsinki. A research fellow (MCD) compiled a list of all children who underwent cataract surgery before the age of 16 years at Moorfields Eye Hospital, London, United Kingdom, between January 1995 and February 2016, based on the surgical notes and the digital database. Children with less than 5 years of follow-up or with an interval of more than 6 months between surgery for the first and second eye were excluded (Figure 1). We also excluded all cases associated with eye disorders other than MMP, secondary cataract (except two children with metabolic disorders: diabetes type 1 and galactosemia), cataract as part of syndromes (also in the group of eyes with cataract associated with MMP), and diagnosis of glaucoma before cataract surgery. We reviewed the clinical and the digital database and collected demographic, clinical, and surgical data. Selection of cases for inclusion in the study population. Exclusion criteria were duration of follow-up less than 5 years, significant intraindividual differences in age at surgery, cataract associated with eye disorders other than microphthalmia, microcornea, and persistent hyperplastic primary vitreous (MMP), secondary cataract, cataract as part of syndromes, and diagnosis of glaucoma before cataract surgery. We entered all data into a Microsoft Excel (Microsoft Corporation, Redmond, WA) spreadsheet and performed a descriptive analysis. We dichotomized both groups (isolated cataract and cataract associated with MMP) by age at surgery (early intervention group: ≤ 48 days, later intervention group: > 48 days).25 Median and interquartile range (IQR) were calculated for non-normally distributed data. Proportions were calculated for categorical data. In case of unilateral cataract, we included data of the affected eye only. In case of bilateral cataract, we selected one eye randomly. All lensectomies had been performed under the care of a single consultant surgeon (GGWA) using a limbal incision approach. Regardless of age at surgery, a primary posterior capsulorhexis was performed if the visual axis was not adequately clear after lens removal. The implantation of an intraocular lens into the capsular bag or the sulcus was considered only in children older than 4 months at the time of surgery. At the end of the procedure, all children received a subconjunctival injection of betamethasone and cefuroxime initially by subconjunctival injection or intracameral injection. Topical cycloplegic and steroid and antibiotic drops were tapered over 6 to 8 weeks postoperatively. We identified 304 children who had undergone cataract surgery between January 1995 and February 2016. According to the exclusion criteria, we included 111 children in the study: 86 with isolated cataract and 25 with cataract associated with MMP (Table 1). Demographic data are shown in Table 2. The median duration of follow-up was 95.9 months (IQR: 76.0 to 154.5 months). In bilateral cataract, the proportion of eyes with BCVA worse than 0.3 logarithm of the minimum angle of resolution (logMAR) was 80% in the early and 78% in the later intervention group. In unilateral cataract, the proportions were 67% (early intervention group) and 100% (later intervention group). A total of 60% (early intervention group) and 89% (later intervention group) of the children with bilateral cataract were diagnosed as having strabismus/nystagmus. In unilateral cataract, the rate of strabismus/nystagmus was 100% in both age groups (Table 2). In bilateral cataract, 56% in the early and 33% in the later intervention group had a BCVA worse than 0.3 logMAR at the last visit. All eyes (100%) in the early intervention group with unilateral cataract had a BCVA worse than 0.3 logMAR. This proportion was slightly lower in the later intervention group (83%). In bilateral cataract, 88% of children in the early and 59% in the later intervention group had strabismus/nystagmus. 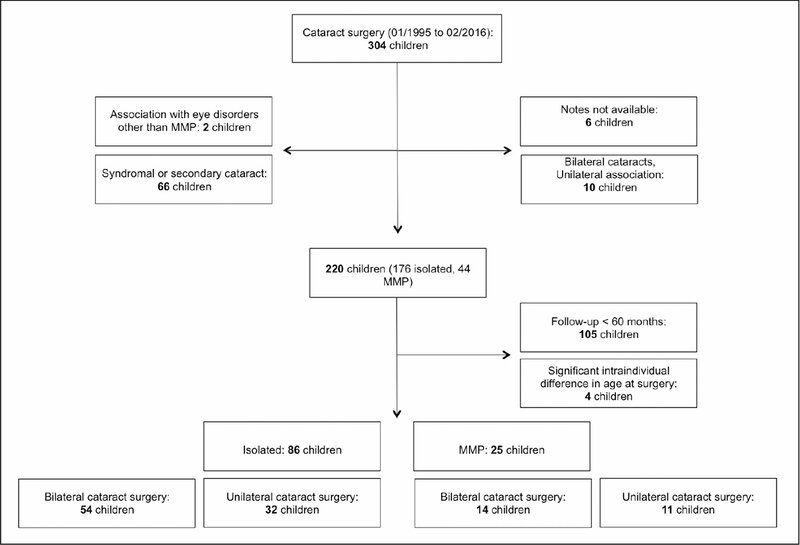 The majority of children with unilateral cataract had strabismus/nystagmus (early intervention group: 100%; later intervention group: 93%) (Table 2). 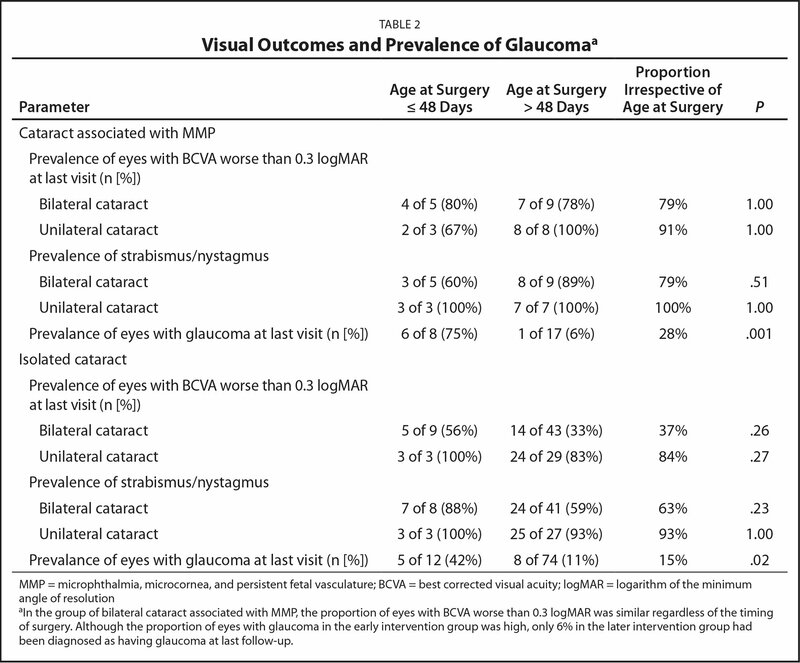 A total of 28% of all eyes with cataract associated with MMP developed glaucoma (Table 2). Although the proportion in the early intervention group was high (75%), only 6% in the later intervention group had been diagnosed as having glaucoma at last follow-up. A total of 15% of eyes with isolated cataract had glaucoma (early intervention group: 42%; later intervention group: 11%). Secondary posterior capsule opacification was the most common complication in children with cataract associated with MMP (overall: 42%; early intervention group: 29%; later intervention group: 47%) and in children with isolated cataract (overall: 68%; early intervention group: 33%; later intervention group: 74%). There were no cases of retinal detachment. The median of secondary surgical interventions in children with cataract associated with MMP was 2 (IQR: 2 to 2) in the early intervention group and 2 (IQR: 1 to 2) in the later intervention group. In the isolated cataract group, it was 2 (IQR: 1 to 2) and 1 (IQR: 1 to 1), respectively. Our main findings were the high risk of glaucoma in infants with cataract associated with MMP undergoing lensectomy before the age of 48 days and the absence of better visual outcomes with early surgery. Although acceptable functional outcomes in infants with microphthalmic eyes have been reported previously,15,19,23,26–29 the high risk of glaucoma without the benefit of improved visual outcomes needs to be taken into consideration in the treatment of infants with cataract associated with MMP. The major limitations of this study are its retrospective design and missing data on the severity and type of cataract at diagnosis. Although surgery for congenital/infantile cataract should be undertaken between 4 and 10 weeks of age,30–33 this is not always possible. Mild lens opacities or those becoming denser over time may not be detected at routine yearly developmental checks. This may introduce a systemic bias, in that children with dense lens opacities or associated MMP are more likely to have an earlier diagnosis and early intervention. This bias may affect our observations with regard to visual outcomes and their links to the timing of surgery. The low number of cases in the group of children with cataract associated with MMP is another limitation that results from our inclusion/exclusion criteria. We excluded 14 children with bilateral cataract with unilateral developmental eye disorders and children with an interval of more than 6 months between surgery on the first and second eye. Previous studies focused on the impact of MMP rather than grouping these associated developmental eye defects. All have been associated with worse visual outcome. However, it is unclear if or how far these conditions differ regarding their impact on visual prognosis. It would be interesting to investigate these differences. However, because they frequently coexist and it is impossible to quantify the specific impact of each condition in itself, we decided to pool all three conditions. Cataract associated with MMP is more likely to be followed by postoperative complications. To account for the retrospective nature of the study, missing data, and variability in terminology in the handwritten notes, we decided to report the prevalence of aphakic/pseudophakic glaucoma, secondary posterior capsule opacification, and the number of subsequent surgeries only. The visual outcomes of the current study lie within the range of previously reported results. However, due to the heterogeneity regarding inclusion criteria, methodology, and the high variability in reporting the visual outcome, it is difficult to evaluate the overall external validity of our findings in children with cataract associated with MMP. The prevalence of aphakic/pseudophakic glaucoma in this group ranges from 0%18 (mean duration of follow-up: 24 months) to 41%19 (mean duration of follow-up: 115 months). Our finding that 75% of children in the early intervention group were diagnosed as having glaucoma clearly militates against early surgery in children with cataract associated with MMP irrespective of visual outcome. Considering that the proportions of children achieving a BCVA of 0.3 logMAR or better was similar in the early and later intervention groups (in eyes with cataract associated with MMP), the low rate of glaucoma we found in the later intervention group speaks for late surgery in children in this subgroup. Visual Outcome and Glaucoma: Isolated Cataract. Data on qualified visual acuity in children with bilateral cataract undergoing surgery at 48 days or younger are sparse. Gelbart et al.35 found 53% of 17 children (current study: 44% of 9 children) who underwent cataract surgery at 48 days or younger achieved a BCVA of at least 0.3 logMAR. The reported proportions for visual acuities of 0.3 logMAR or better for the group of infants undergoing surgery at 48 days or older range from 44% to 76%.36–38 Our result of 67% of children having a BCVA of 0.3 logMAR or better at the final visit lies within the range of these previous results. In our study, the prevalence of secondary aphakic/pseudophakic glaucoma in the early intervention group was high (42%) and was below the average of previous studies in the later intervention group (mean ± standard deviation: 15.5 ± 9.2; range: 3.0 to 32.0).11,36,38–45 Petric and Lacmanovic Loncar41 reported a low prevalence of secondary aphakic/pseudophakic glaucoma of 3%. Because the rate of glaucoma is most likely also determined by the duration of follow-up, it needs to be considered that the duration of follow-up in this study was the lowest of the studies we compared our results with (median duration of follow-up: 26 months).41 Unfortunately, there are no comparable data available for the early intervention group. The median number of secondary surgical interventions ranged from 1 to 2. It is not surprising that secondary posterior capsulotomy accounts for the majority of cases. In the cataract associated with MMP group, the proportion of eyes undergoing secondary posterior capsulotomy was higher in the later intervention group. Considering the higher likelihood of secondary posterior capsule opacification in eyes undergoing primary intraocular lens implantation,46 this can be explained by the policy of leaving most eyes undergoing surgery at early intervention ages aphakic. In eyes with cataract associated with MMP, the overall likelihood of primary IOL implantation was lower,47 irrespective of age at surgery. This might explain the lower rate of secondary posterior capsule opacification in this group. Our findings indicate that surgery for congenital/infantile cataract is associated with a high risk of secondary aphakic or pseudophakic glaucoma, especially in eyes with cataract associated with MMP. Due to the lower prevalence of glaucoma, these children might profit from surgery at older ages. Randomized controlled trials on this vulnerable group of children are unlikely to be carried out. A sufficiently powered (potentially multicenter), prospective, non-randomized study, taking into account the anatomical situation at the time of diagnosis, the high variability and wide spectrum of potentially coexisting eye conditions, and the burden of children with glaucoma, might help to optimize the care of children with cataract associated with MMP. Chen TC, Bhatia LS, Halpern EF, Walton DS. Risk factors for the development of aphakic glaucoma after congenital cataract surgery. Trans Am Ophthalmol Soc. 2006;104:241–251. Rahi JS, Dezateux C. Congenital and infantile cataract in the United Kingdom: underlying or associated factors. British Congenital Cataract Interest Group. Invest Ophthalmol Vis Sci. 2000;41:2108–2114. Khvatova AV, Agatova MD. Clinical characteristics and results of microsurgical treatment of bilateral congenital cataracts associated with microphthalmos [article in Russian]. Vestn Oftalmol. 1991;107:32–35. Li L, Fan DB, Zhao YT, Li Y, Cai FF, Zheng GY. Surgical treatment and visual outcomes of cataract with persistent hyperplastic primary vitreous. Int J Ophthalmol. 2017;10:391–399. Birch EE, Stager D, Leffler J, Weakley D. Early treatment of congenital unilateral cataract minimizes unequal competition. Invest Ophthalmol Vis Sci. 1998;39:1560–1566. Birch EE, Stager DR. The critical period for surgical treatment of dense congenital unilateral cataract. Invest Ophthalmol Vis Sci. 1996;37:1532–1538. Petric I, Lacmanovic Loncar V. Surgical technique and postoperative complications in pediatric cataract surgery: retrospective analysis of 21 cases. Croat Med J. 2004;45:287–291. Urban B, Bakunowicz-Lazarczyk A. Aphakic glaucoma after congenital cataract surgery with and without intraocular lens implantation. Klin Oczna. 2010;112:105–107. Ma CX, Lu Y, Lu J, Yang L, Tan FL, Li BB. Clinical analysis of aphakic glaucoma following infantile congenital cataract surgery [article in Chinese]. Zhonghua Yi Xue Za Zhi. 2016;96:2176–2178. From NIHR Biomedical Research Centre at Moorfields Eye Hospital and UCL Institute of Ophthalmology, London, United Kingdom (MCD, GGWA, AD-N); and Eye Center, Medical Center, University of Freiburg, Freiburg, Germany (MCD).